Weight lifting at home with dumbell routines can be a pretty appealing alternative for those who aren’t interesting in pricey gym membership or shelling out thousands of dollars for a power rack and Olympic weight lifting set in their basement. It’s entirely possible to get an excellent workout at home using only dumbells and a bit of creativity. Here are two excellent dumbell routines for anyone interested in weight lifting at home. The first is great for general fitness – it will build some strength, muscle mass and core stability, and it’s a great place to start if you’re a beginner looking to get started with your set of dumbbells at home. The second routine is more advanced and is geared towards athletes and bodybuilders looking to maintain or increase strength and/or size when unable to get access a rack and barbell. It’s great for holiday workouts in small hotel gyms, for example. This is a full body workout that should be performed 2-3 times a week. Try not to perform workouts on consecutive days, so that your body has time to recover. Lift with great form, and stay well away from muscular failure (and if you don’t know what that means, check out these safety tips). The dumbbell squat is the most important exercise in this routine, believe it or not. Find out about proper dumbbell squat technique here. 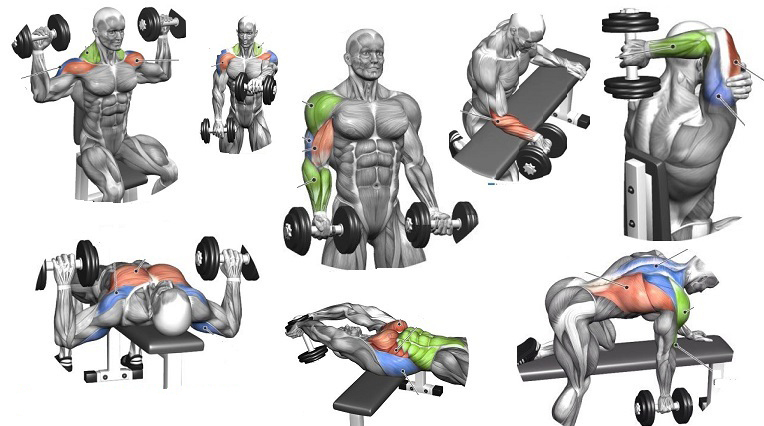 The dumbell row and bench press are only to be performed if you have an adequate flat bench to do so. The workout should be done 2-3 times a week, starting with the tougher compound exercises (squat, bench press, row) and finishing with the isolation movements. Add weight when you can comfortably complete 10 reps on each exercise. Regarding the exercises, Pistols are the best exercise you can do for your legs outside a squat rack. They are essentially a 1-legged squat, with your unused leg stretched out in front of your body to enable you to go deep on the working leg. It takes some time to develop the necessary balance. You can practice them by doing them from a low chair or bench, box-squat style. When you get really good, you can do the pistol holding dumbells either side… or even turn it into a 1-legged jump-squat(!). The standing dumbell shoulder press also requires fairly good balance, and it’s an excellent movement for athletes looking for that strength of “one piece” – the whole body working in unison. If you’re accustomed to seated presses, you may be somewhat surprised at how little weight you can lift with this exercise. Stick with it though, it’s excellent for athletic performance. To save time with dumbbell rows, or in the absence of a bench, you can do them with the same form as bent over barbell rows, but with a dumbell in each hand.